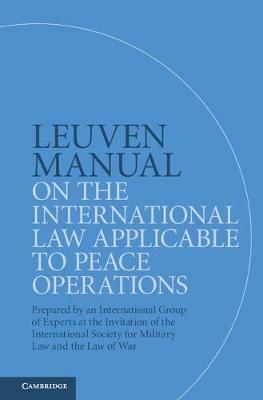 The Leuven Manual is the authoritative, comprehensive overview of the rules that are to be followed in peace operations conducted by the United Nations, the European Union, NATO, the African Union and other organisations, with detailed commentary on best practice in relation to those rules. Topics covered include human rights, humanitarian law, gender aspects, the use of force and detention by peacekeepers, the protection of civilians, and the relevance of the laws of the host State. The international group of expert authors includes leading academics, together with military officers and policy officials with practical experience in contemporary peace operations, supported in an individual capacity by input from experts working for the UN, the African Union, NATO, and the International Committee of the Red Cross. This volume is intended to be of assistance to states and international organisations involved in the planning and conduct of peace operations, and practitioners and academia.